It all seemed to be going so well as Heineken Cup rugby returned to Watford again. Despite some early pressure from Glasgow, Saracens' Hugh Vyvyan crossed the line in under 10 minutes, and they began to turn the screws, adding another two before half time, from Rodd Penney and Ben Skirving. But Glasgow' John Barclay clawed one back, and Dan Parks kept lining up the penalties, so Glasgow were only 25-11 down at the break. Things started to go down hill in the second half. 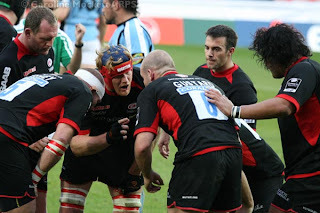 Sarries defence lots its shape, and the fans were in for a nailbiting time as the clock ticked down. Kameli Ratuvou [left] crossed from a run up the wing, to bring up Saracens' 4th try, so a bonus point was at least in the bag. 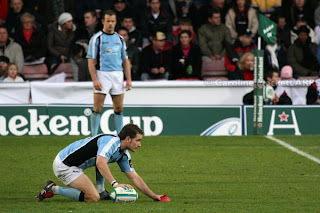 But then Hefin O'Hare and Ally Kellock scored a couple of converted tries after some sloppy defence. It was only Glen Jackson's 79th minute penalty that saved the day, so the Men In Black went back into the dressing room 2 points up rather than 1 point down, but they were still kicking themselves for not being more clinical. Alan Gaffney is rightly spitting feathers about it. After all, even though they are top of Pool 4 at the end of round 1, they are away to Biarritz next week, which won't be an easy task at all, especially if the defence leaks tries like they did on Sunday. Cencus Johnston had another great game, and the scrum was still pretty strong, which will be important next week. And the other prop, Kevin "Po Po" Yates was seen sporting a rather fetching scrum cap for much of the game, which is not his usual style. Either he's worried about getting Cauliflower Ears all of a sudden, or the medics were trying to hold on a dressing from a bash to the head early on! You can see the rest of my photos from Sunday's game here. It was getting on for two months since I've seen any live rugby. 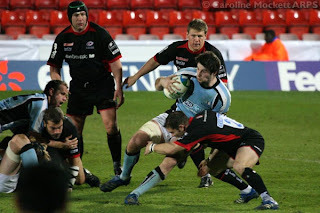 My broken elbow is now well on the mend, and I'm able to drive again, so I booked up a few Saracens games the other day and enjoyed the Anglo-Welsh Cup game against Bristol at Vicarage Road on Sunday. In the second half, the Men in Black really turned the screw, and ended up with a 45-15 victory. In scoring five tries, they earned themselves a bonus point to top their group after two matches. The best sign was the quick ball which they seemed to be getting - in no small part due to the phenomenal work of Mosese Rauluni. He had a great World Cup captaining Fiji, and seems to have returned to the team with all cylinders firing. The other thing I noticed was the way the whole team were passing out of the tackle, rather than going to ground with the ball. This speeded things up too, and made for some exciting to watch rugby. And an honourable mention must also go to 20-stone prop Cencus Johnston [leftt], who oustripped Bristol's winger to catch the ball down the left touchline, and set up a pass and try for Kameli Ratuvou, who touched down twice during the game. This, after Cencus had been down injured a few minutes before, holding his ankle and hobbling badly when he first got back to his feet! He's another player who had a good World Cup - and his colleagues in the Saracens Front Row were making mincemeat of the Brizzle boys for most of the afternoon. 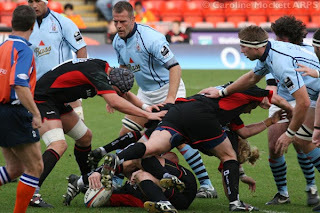 They even won a couple of scrums against the head, which doesn't happen that often these days. I was also pleased to see some of the Saracens' replacements making a nuisance of themselves when they came on the pitch. Adam Powell did well in place of Andy Farrell, giving Alan Gaffney a potential selection dilemma for next week's Heineken Cup game against Glasgow. Neil de Kock was his usual scrum-bossing self, and No. 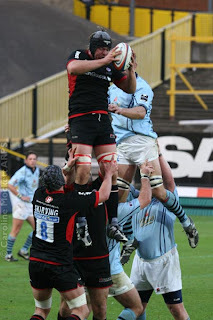 16 Andy Kyriacou was rewarded with 5 points when his forward mates drove him over the Bristol line from a close range lineout in the dying minutes. It's good to be back at Vicarage Road, and I'm looking forward to seeing our Scottish friends next week. Meanwhile, you can see the rest of my photos from Sunday's game here. It was the 70th game I have photographed since February 2004 - how time flies!